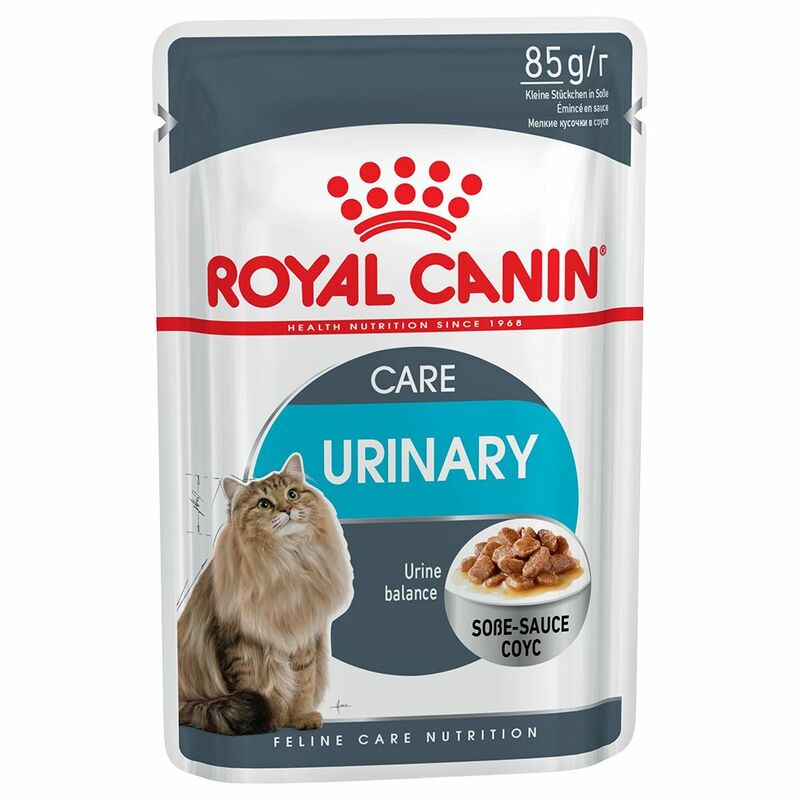 Royal Canin Urinary Care in Gravy is a high-quality complete food for adult cats. This premium wet food contains the special Urinary Care Formula to help maintain a healthy balance of minerals in your cat's urine, supporting feline urinary tract health. It has been developed to perfectly meet the nutritional needs of adult cats, meaning that it can help your cat to maintain its ideal weight. Theses pouches contain delicate chunks in gravy that are not only delicious, but also provide your cat with an optimum balance of important nutrients. Royal Canin Urinary Care in Gravy at a glance: High-quality complete wet food for adult cats Supports feline urinary tract health Contains an optimal combination of the nutrients that cats instinctively prefer Delicate chunks in hearty gravy Helps your cat to maintain an ideal weight Easy to portion in a handy fresh pouch Royal Canin wet cat food offers balanced and complete care for your cat: EΒential fatty acids: supply valuable energy, support your cat's natural defences and can promote a gloΒy coat Plenty of vitamins: have an antioxidant effect, help to strengthen the immune system and support the metabolism Minerals: can have a positive effect on your cat's metabolism and promote a healthy coat and bone structure Dietary fibre: promotes a balanced gut flora and healthy digestion Proteins: for the optimal development of your cat's organs, muscles and connective tiΒue High digestibility: careful selection of raw ingredients ensures a protein digestibility of at least 90% The instinctive preference – the Macro Nutrient Profile: the new health-diet with the Macro Nutrient Profile (MNP) is a formula adapted to the life phase and individual features of cats. The Macro Nutrient Profile describes the distribution of nutrients which provide energy. It signifies optimal proportions of proteins, fats and carbohydrates for long-term acceptance. The specific Nutrient Profile of cats varies with age, but also with physiological status (e.g. pregnancy, lactation). Cats know which nutrient profile is most suited to them and choose their food accordingly. Combined with Royal Canin's knowledge and years of experience, the Macro Nutrient Profile will guarantee the exceptional, long-term acceptance of this food. Your cat will not get bored of Royal Canin Feline Health Nutrition products, so it is not neceΒary to vary the taste each mealtime, especially as taste is not a deciding factor for your cat.